DC Comics Batman ArtFX Jim Lee Statue Figure by Kotobukiya. Condition is Used. 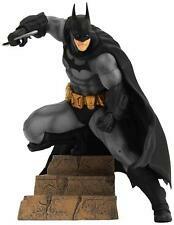 KOTOBUKIYA ARTFX DC COMICS BATMAN ARKHAM CITY STATUE. Condition is Used. Shipped with USPS Priority Mail. - Batman: Arkham City - Batman ArtFX 1/10 Scale Figure by KOTOBUKIYA. Statue stands in around 1:7 scale & includes multiple face plates and a display base. Official Kotobukiya product. These photos represent the exact item you will receive. Batman The Animated Series ARTFX Statue Kotobukiya 1:10 scale. (Does not come with box, used photo to show all the expressions and accessories the statue comes with). The stand is also a case where all the parts go in. Any questions please ask. US only, Paypal only. Thanx for looking! Kotobukiya DC Comics Batman Rebirth: Batman ArtFX 1/10 Scale Statue. Pre-painted statue. Shipped with USPS Priority Mail. Kotobukiya Batman Statue ArtFX Figure DC Justice League Movie - New 1/10 Batman is new and unopened!!!! He has Never been displayed! He Comes from a smoke free and vape free comic book home so well taken care of! box is in all right shape as you can see by the pictures there is a hole in the box. It was there when I bought it. Statue is all good!! I am selling some of my collection to make my wife happy! Happy wife happy life!! I have too many items. So don’t be afraid to offer my loss your gain! Please If you have any questions please don’t hesitate to ask!!! Have a blessed day and thanks for looking!! Statue stands in 1:10 scale & includes a display base. Official Kotobukiya product. These photos represent the exact item you will receive. Kotobukiya Justice League Batman New 52 ArtFX 1/10 Statue DC Comics. Shipped with USPS Priority Mail. Figure has only been used for display. Comes in it's orginal box. Smudge on box where price tag used to be. DC COMICS BATGIRL ARTFX STATUE NEW 52 VERSION Featuring Batgirl's armor design based on her appearance in the New 52, Batgirl steps straight from the page in this highly detailed sculpt. Batgirl stands confident and ready, hands on her hips with her cape and hair flowing in the breeze. Display alone or alongside other ARTFX statues, such as the Justice League or other characters from the Bat-family such as Batman and Nightwing. NEW ARTFX DC Comics BATMAN NEW52 Ver 1/10 PVC Figure Kotobukiya from Japan. Condition is New. Shipped with USPS Priority Mail. Limited edition pre-owned Batman and Catwoman statue in excellent condition! Certificate of Authenticity is included on the box, this statue is number 2176/2500. This is a great collectible. Statue stands in 1:10 scale & includes multiple face plates, weapons and a display base that doubles as a storage unit for all the extra parts. Official Kotobukiya product. These photos represent the exact item you will receive (with the exception of the open marketing photo). Limited Edition Statue. DISPLAY WELL PICS OF ACTUAL ITEM. Kotobukiya DC Comics Superman ARTFX Statue - Batman, Justice League. Shipped with USPS Priority Mail. Sealed MIB. BvS Armored Batman Statue in Original Box. ~CONDITION~. This listing is for Kotobukiya Batman Vs Superman Diorama Set. The set is in mint condition! It was briefly displayed in a glass Detolf case. Item was displayed. Statue in mint condition. Box is in good condition minus a tear in corner when opened. Kotobukiya Batman ArtFX Statue 1/6 Scale PVC Black Costume Version. Condition is Used. Shipped with USPS Priority Mail.